13, 8 leaves ; 28 cm. Agricultural extension work -- Portugal. 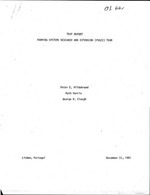 Agricultural systems -- Research -- Portugal. "Lisbon, Portugal ; December 11, 1981." ... .. ..... .. ....... .......... ..
-h 1-1, 11-il il t-11. .. ........... .. ..... ..
-W AAAAAWA~AAAI 1A AA-AAA AA1 d.